No longer resigned to the pages of science fiction texts, automation and artificial intelligence are entering mainstream usage at a staggering rate. Despite growth, however, both industries remain mysterious to many. Get expert knowledge on automation and AI, including specific details on how a computer science degree can put you at the forefront of groundbreaking technology. Andrew has done work for organizations including Google, Pfizer, Mars Inc., the USDA, and the US Department of Homeland Security. He received his undergraduate degree at Cambridge, where he later returned to earn his PhD in Computer Science. In 1993, he joined Carnegie Mellon University as an assistant professor. In 2006, he joined Google as a VP of Engineering. In 2014, he returned to CMU as the Dean of the School of Computer Science. Based on his extensive experience managing QA and testing for global companies, Roy recognized the need for an on demand “real-world” testing solution – and the Applause concept was born. The company counts Google, Amazon, and RunKeeper amongst its thousands of clients, and has created award-winning analytics utilizing artificial intelligence to help companies quickly see what users love and dislike about their apps. LeaderAmp is an artificially intelligent platform for mobile coaching and psychometrics. Dr. Barney has authored four books, four patents (one pending), more than 40 peer-reviewed works, and has presented 179 talks in 14 countries. In 2015, he was appointed to the Business Affairs committee of the scientific publisher Annual Reviews. He holds a Ph.D. in Industrial-Organizational Psychology from the University of Tulsa. In June 2015, Amazon began publicly selling the Amazon Echo, an always-on artificially intelligent Bluetooth speaker that can hear, comprehend, and answer any question. In September 2015, Google announced to the world that it was getting serious about making self-driving cars available to the public – and soon. Since 2009, the company has been promoting its self-driving car project, with prototypes tested throughout California and Texas. And in October 2015, Tesla rolled out its semi-autopilot driving feature to its Model S cars. For many, automation and the use of artificial intelligence seemed to be far off in the future, but these recent developments suggest they may be closer than we think. This guide explores today’s world of automation and AI. Readers will learn what automation and artificial intelligence are, how these technologies are used in a variety of industries, and discuss where the field is going, according to AI and automation experts. The field is expanding and evolving, making it an exciting time for computer science and technology students to start participating. Learn about potential degree paths and how you can help contribute to the field. Automation can be found in nearly every industry, ranging from transportation and utilities to defense and facility operations. The most prevalent area, however, is undoubtedly manufacturing. With many required tasks being labor intensive or highly repetitive, the creation of automated machinery has improved efficiency and also created greater quality control. Programmed machine tools that perform repetitive tasks; frequently shows up in manufacturing. This type of automation utilizes computer software to control machinery. It’s frequently used to automate scheduling and the flow of manufacturing. FMS combines numerical control systems, robots, and other industrial automation tools into one sophisticated system. FMS allows flexibility and customization within its range of uses. Often seen in automobile manufacturing to make customized parts or similar parts for different vehicle models. Other applications include metal cutting and forming, joining and welding, and surface treatments. Industrial robots can be programmed and manipulated in three or more axes and may operate in fixed or mobile applications. Expansive and wide reaching uses, primarily based on movements. Common areas include welding, assembly, handling materials, and palletizing. The use of machines to take over boring, unsafe and repetitive jobs has been with us for more than a century. There are no horse-and-buggy craftsmen anymore because cars are faster and cheaper than alternatives. The 21st century has ushered in a promise that autonomous vehicles are right around the corner. In fact, Tesla recently announced that its Model S car is now semi-autonomous, and they released this feature to tens of thousands of already owned cars via a software update. The idea of automation within transportation is nothing new, however, with sailboats utilizing auto-tillers and autopilot technologies in airplanes just a decade after the Wright Brothers iconic flight. Still, developing automated systems to navigate streets and highways is something entirely different, and the stakes are much higher. While the idea has been on the table since the 1939 World’s Fair, it’s taken decades of research and prototyping to get to the cusp of practicality. Before Tesla’s autopilot feature, the most significant advancement was Google’s Driverless Car Program, which has logged nearly 150,000 miles of autonomous driving since 2009. These two terms are often used interchangeably, but there are clear differences between the two, all of which have implications for both consumers and car makers. Autonomous, or driverless, cars look similar to cars on the road today and still feature all the same driver systems we know and use regularly, such as steering wheels, brakes, and gear sticks. Some cars already have driverless components, such as self-parking, intelligent cruise control, and intuitive braking. Unlike self-driving cars, however, autonomous cars are interchangeable between human driving and driver assistance programs. Self-driving cars are considered a step beyond autonomous cars. In this case, there is no steering wheel and no driver’s seat. Additionally, self-driving cars rely entirely on a computerized system of GPS capabilities, sensors, and radar technology to guide the car without any human assistance. According to The Economist, this model radically changes the user and maker role, as analysts predict sales of vehicles to individuals could potentially fall by 40 percent as multiple riders share driverless vehicles. Also known as unmanned aerial vehicles (UAVs), these can be controlled by an onboard computer or a remote automation system. These vehicles have historically been used in military maneuvers, ranging from combat and reconnaissance to serving as decoys. Recent years have seen the rise of public and commercial uses, including aerial footage and Amazon’s Prime Air service, which plans to use UAVs to deliver packages to customers in 30 minutes or less. A raft of water-based autonomous vehicles exists, ranging from submarines and sailboats to gliders and autonomous underwater vehicles (AUVs). Uses for these systems vary widely. For example, automated submarines have been deployed in combat situations, while unmanned yachts are popular with uber-wealthy travelers. While the idea of an autonomous car has been floating around for decades, only in the last 30 years has it begun to take real shape. Research labs and universities sponsored most of the early prototypes, with Carnegie Mellon leading a significant charge in the 1990s. Companies pushing this concept forward today include Google, QNX, Delphi, Cisco, and Continental. The automation of work was born out of economic theories on mass production and the ability to manufacture products efficiently and safely. What started as robotics for simple and mundane tasks has now revolutionized the way people and companies do work. Paperless billing allows companies to send invoices via services that automatically send paperwork through a database server, eliminating the need for a human to sort through paperwork and mail confidential information to each and every individual. Today’s HR and recruiting managers receive the majority of, if not all, resumes and applications via automated applicant tracking systems. These systems allow users to upload job application materials when applying for a role. HR/recruiting professionals then receive streamlined packets that can be organized and managed through various settings. Be it an email, calendar, or project management alert, these automated reminders help workers stay on top of tasks so they can carry out their duties in a timely manner. For companies with multiple users editing and changing documents, automated services such as Google Docs allow for instant updates by multiple parties. Automation allows individuals to drastically save time on testing (e.g. software testing, QA testing, web link testing) and running reports. Tests can be done repeatedly, any time throughout the day. Reports can then be generated and outcomes compared to improve effectiveness and efficiency. Ever notice how Amazon keeps track of recent purchases or online shopping history and automatically suggests similar items? This automated version of cross selling increases purchases by analyzing consumer buying and browsing habits. Today’s web browsers make completing forms – and even URLs – faster and easier though auto complete features. Simply start typing and after the first few letters, you’ll have the option of filling out the rest of the form with a simple click. While the formulas in Microsoft Excel can sometimes be exasperating, functions such as auto-sorting, criteria-based entry management, and pulling web data into an Excel file are all examples of automation. Automatic updates ensure that users have the most up-to-date versions of applications, software, and operating systems. Automatic updates also allow IT departments to focus on more critical issues by automating tasks such as installations. Collecting and managing data, especially large datasets, can be time consuming and mundane. Automation makes it easy to migrate data from a database to excel or to transfer data from one database to another. So much energy is going into helping humans, not replacing them. Artificial Intelligence is a broad and growing field that is still mysterious to many. AI works in myriad ways, but the overarching ideology is using computers to solve problems typically requiring human intelligence and understanding. Another way of looking at AI is taking human skills and tendencies and applying them to inanimate objects or ideas. One well-known example of AI is the Turing Test, developed by mathematician Alan Turing in 1950. In this case, the idea was to create a computer that could convince a human being that he or she was speaking to another human being across a screen. For over 60 years, computer scientists across the world struggled to reach this threshold. It was only in 2014 that a Russian program managed to successfully imitate conversational behavior enough to convince 33 percent of the judging panel that it was human. Much like automation, artificial intelligence applications make it possible for machines to complete real human tasks. Some of the common skills currently imitated by AI include visual perception, speech recognition, decision-making, and adaptability. What Industries Use AI Today? From text completion programs to voice-to-text to intelligent assistants, smartphones and mobile devices are rapidly embracing AI. Such technology focuses on human cues, including voice analysis and heart rates, to provide services based on intelligent understanding. As mobile AI continues to grow, software is expected to be more anticipatory in the coming years. Big data is revolutionizing consumer and product analysis, and AI applications are helping companies sift through tremendous amounts of data to collect insights. Once one AI program has dug through collected information, other AI applications are able to take this raw data and translate it into actionable findings. Examples may include product perception, social media tendencies, or product behavior over its lifespan. Other AI applications that stand to transform business in coming years include virtual assistants, smart coaches, sales representatives, and robotic journalists that can generate reports and news stories mimicking human writing. While fully autonomous cars are still in the distance, driverless trains and metro subway systems are being used at varied levels throughout the world. Toyota recently invested $50 million in vehicle robotics research, while Jaguar Land Rover has put forward £11 million to help solve ongoing technical issues surrounding autonomous driving technologies. Video games use AI to mimic human behaviors and intelligence in non-player characters (NPCs) in games ranging from Chess to car chase scenarios. These characteristics, however, are frequently toned down for human play since algorithms can often see every possible play or move, which creates an unfair advantage. The uses for robots exhibiting intelligent behavior is an ever-expanding area of research, with prototypes already showing limited capabilities in problem solving, learning, and interacting on a social level. Scientific American reported that by 2050, a single robot will be able to perform 100 trillion instructions per second. Though many of today’s uses center around manufacturing, aerospace design and military functions, it’s expected that the coming years will see the expansion of robotic technologies into laboratory work, energy, home automation, and mining. With applications ranging from personal home alarms to international surveillance, AI plays a massive role in keeping individuals and countries safe. Services like intelligent video surveillance analyze footage in real-time to identify and report unusual behavior. AI also helps enforce cyber security by identifying abnormalities in online patterns. Researchers are constantly looking at how AI can reshape and inform the modern classroom, for teachers and students alike. Personalized tutoring programs not only help students in everyday learning, but many also analyze how students process information and provide additional, customized support. This software is especially helpful for students with learning disabilities, ensuring they receive an individualized approach that matches their needs. Other AI applications include services that automate common teacher tasks, such as marking tests or recording grades. What Companies Have Implemented AI in Business? After acquiring DeepMind in 2014 for $400 million, Google solidified itself in the quest to fully develop and utilize AI. The prototype software, which mimics human cognitive development and has its own short-term memory, is thought to be the first significant step toward an artificial brain. The multi-billion dollar company also owns Nest, a series of home products that leverage AI technology. Demonstrating its commitment to the field of AI, IBM has spent millions of dollars on its flagship system, Watson – the platform that won the TV show Jeopardy! The cognitive computing system is also used in oncology centers to gather valuable insights from extensive patient records and conduct research that may help eradicate cancer. The platform’s engagement advisor is also used in finance and telecommunication industries. The social media platform has three labs dedicated to AI development, with a number of AI functions – such as facial recognition – already in use. Founder Mark Zuckerberg recently hinted at future development of speech and language related applications. Apple’s competitor has a number of AI applications in development, ranging from a digital assistant known as Cortana to a variety of platforms focused on image recognition and translation capabilities. Based in China, Baidu is to the country what Google is to America. The search engine conglomerate’s focus on deep learning has seen success in areas of speech recognition, image recognition, and intelligent advertising. While the full implications for widespread integration of automation and AI remain to be seen, analysts in the field are already seeing significant shifts. Between 2011 and 2013, over 320,000 robots were created and sold, with Japan, South Korea, China, Germany, and the USA leading the charge. In China alone, labor productivity doubled between 2007 and 2012. 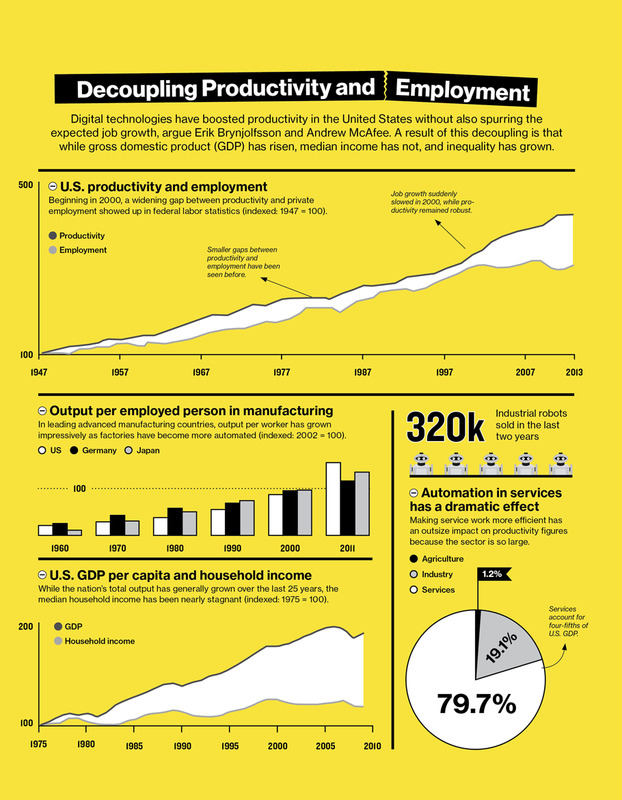 Mass use of AI technology creates economic prosperity, but MIT researchers are quick to point out that overall larger gross domestic product (GDP) is rapidly outpacing growth in household incomes. The following section reviews some of the main concerns about the consequences of automation and AI from both sides. Robotics is particularly appealing in industrial manufacturing, where robotics has revolutionized mass-production. Because robots are so good at doing repetitive tasks, the streamlined production model not only increases capacity, but also eliminates human error and delivers higher levels of quality assurance. Work of this nature has historically been divided into three shifts, but robotics have allowed for a nonstop, 24/7 production line. Though working conditions in factories are rarely reviewed favorably, a shift towards automation and AI means fewer workers are spending their days in dangerous or overly laborious roles. By replacing humans with industrial robots to do mundane or unsafe tasks, the number of workplace casualties is expected to fall across industries. According to International Business times, the average cost of an industrial robot used in manufacturing durable goods is currently $133,000, a drop from $182,000 in 2005. Although introducing automated or AI platforms can be costly on the front end, the lifetime return on investment as compared to human workers produces significantly lower overhead. Additionally, the one-time investment in these technologies means that companies can also eliminate salaries and health insurance once those positions are automated. Opportunities for new types of human roles. As of now, one of the biggest drawbacks of automation and AI are their inability to use the cognitive functions that inform human interaction. In jobs like nursing or mental health where empathy is mandatory, opponents cite the inability of robots to express emotions is a significant shortcoming. This is could also be a concern in careers focused on creativity, where automation and AI fall short of understanding cause and effect or relaying human emotion. While there has been some success with robotic journalism, these are more focused on delivering facts rather than displaying any level of sensitivity to the human condition. Machines are able to hold vast amounts of data, but they process and store information in completely different ways than the human brain. The ability to recall information based on memories or events cannot be duplicated as-of-yet, leading to certain restraints on memory and data retrieval. How did you first become involved in this industry? What drew you to it? Around the ninth grade, I read about Natural Language work at MIT and CMU and I was astonished that sci-fi-style AI was maybe going to happen in my lifetime. This was around 1980. I really jumped into the area after working at HP labs on software verification. I decided I didn’t want to miss out on AI, so I decided to do a PhD in robotics. It ended up being around machine learning for robotics. I am now in a position of being responsible for making sure an amazing faculty is getting everything they need to help them educate the absolute elite of the elite in computer science. That is exciting but daunting. If we do a lousy job, will we hold back the field for a few years? But here is what is most interesting about that: our students are learning how to run organizations and solve world problems through algorithms and data management. But that’s only part of their education…we plan their education so they are well-rounded enough to take on the policy-making and ethical questions they will face in their careers as they use this power. What would you say to those who are concerned over losing the “human” aspect and it being replaced by automation, whether it be job losses as machines replace workers or the concern of a “robot world”? The most exciting AI advances I am seeing at CMU at the moment all have one thing in common. They are about making human lives richer and helping us make informed decisions, learn faster, avoid catastrophes. Great examples are Prof Amy Ogan, using AI to help teachers do better teaching, Tuomas Sandholm, using game theoretic AI (which he also used to win the world computer poker championships) to make the most effective decisions in Kidney transplant planning, or Jodi Forlizzi and Sidd Srinivasan aiming to get a fun-to-use robot arm on every powered wheelchair in the world. So much energy is going into helping humans, not replacing them. Knowing what you know about automation/artificial intelligence presently, how do you see the field growing and expanding in the coming years? Mainly from the industry side of AI, we will see people having conversations with their personal devices, and getting advice and guidance (as in the start of the movie “Her” for example). This platform is going to mean that researchers, entrepreneurs and grad students around the world will be busy adding extra pieces of artificial intelligence to these platforms wherever they can and these crowd sourced AIs will be useful. “Andrew, the FatBegoneApp wants to point out that this steak is much bigger than you intended. Please take half to go”. For someone considering entering this field, what are the most important skills they should possess? Math. When you think you have got a strong enough math background to go into computer science, your next step is take more math. We love it when candidates for our undergrad program have done creative things with computers in the past, and we love it when we see signs of real leadership and initiative in their activities. Demonstrated success and happiness with math is the single most important thing for being able to handle the deep insights of information and algorithms. I think we’ll see automation continue to explode in areas where there are real tangible benefits, such as automotive, energy, medical uses, and manufacturing. While some may worry about a robotic takeover, leading researchers point out that the most exciting automation and AI advancements are focused on enriching the human experience and freeing people up to lead fuller lives. Dr. Andrew Moore speaks favorably to the future of the field. [AI advances] are about making human lives richer and helping us make informed decisions, learn faster, avoid catastrophes. Researchers in these areas are pioneering concepts on the frontier of human thought and capability, with outcomes that would have simply been unimaginable previously. Much of the findings remain in a raw state, meaning their application has not been fully explored or utilized. Those interested in pursuing the field will enter at a particularly pivotal and exploratory time. While many of the concepts synonymous with automation and AI are abstract, the best in the field understand how to translate them into viable programs and platforms that serve specific purposes or functions. Emerging research can sound like a foreign language to the uninitiated, so automation and AI professionals must be able to communicate their findings and ideas in relatable terms. What makes sense in the lab won’t always make sense in a boardroom. Many CS programs provide specializations, allowing students to receive both the necessary generalist skills and more specialized knowledge. Students can study foundational areas such as data structures, software design and testing, web development, and linear algebra before moving into more specific studies. Requiring a diverse set of skills, NSEs focus on designing systems that help computers communicate with each another and with humans effectively. They may direct a variety of different networks, from either the hardware or software perspective. These professionals develop and run tests on automated products and systems to ensure they are safe, effective, efficient, and able to meet the needs of specific functions. Frequently working closely with other engineering teams, they must be future focused and able to understand the practical application of automation. Professionals in this career often work in specific areas of software development, including deep learning, data mining or machine learning. They may develop behavioral software for large companies looking to learn more about their users, or work on facial recognition software for companies like Facebook. These degrees are typically offered at levels ranging from undergraduate through doctoral, with a mix of topics that provide an interdisciplinary education. Common courses may include computation and logic, functional programming, object-oriented programming, linear algebra, proofs, calculus, and data analysis. Students will gain experience both in the classroom and the field, with numerous programs offering internships to build skills and gain professional contacts. This role generally calls for professionals who are able to focus on both business tasks and mathematical sciences, with responsibilities being solution-oriented. They may work on inventory management, manufacturing operations, mathematical modeling, or the application of machine learning. Conceptual by nature, those who work in video game design are able to see the big picture when developing a game with stories, rules, variables, and intrigue. They must possess a mix of creativity and advanced mathematical understanding. These roles require professionals to use their skills in mathematics to design algorithms relevant to specific areas, such as big data, search engines, language analysis, facial recognition, and artificial intelligence. Degrees in electrical engineering prepare graduates for future careers in automation and AI through studies in mathematics and physics, electronics, computer science, automation technology, systems engineering, and metrology. Skills are honed through both classroom teaching and extensive laboratory exposure, where students are able to see current research and findings at work in practical scenarios. EAEs create and carry out research to test the safety, efficiency and overall performance of automated/AI systems. These findings are then used to create reports, which inform the development of future iterations. They may also consult on how to implement automated systems into existing production processes. Frequently working with individual companies, automation engineers manage the workflow of production and implement automated systems to increase productivity. They may also be in charge of handling technical support to ensure these sophisticated systems are running smoothly and effectively. ICTs work directly with robotic systems and automated platforms, repairing and maintaining them to ensure maximized capacity. They are also attuned to safety, paying close attention to any potential areas for concern or ways the machines could malfunction in harmful ways. Degrees in robotics range from the associate to doctoral level and incorporate coursework in areas of artificial intelligence, machine learning, computer vision, and motion planning. Graduates possess the skills and knowledge needed to understand the science and mechanics behind robotic innovation, both through classroom lectures and laboratory exercises. Professionals in this career focus their skills on engineering and creating robotic technologies fit for use in a variety of industries and settings. They may also test new robotic technologies to understand shortcomings or areas of improvement. Typically requiring less education than a robotics engineer, these technicians often assist with the development and testing of prototypes and perform tasks such as welding, data analysis, programming and repair. Often focused in a specific area such as manufacturing or healthcare, robotic scientists are interested in the research of devices relevant to their field, as well as the design and creation of prototypes for testing. When I was 15 I started working at a PC gaming company as a part time game developer/QE. I was focused on taking the English version of a game and localizing it for other markets. I was hooked immediately by the challenge of how quality influences the user experience and the success of the game. Over the years and after building hundreds of products, I’m still fascinated by the technical challenge of making users happy with the quality of a product and the influence that a single aspect has on a product’s success. Now with automation, people are trying to solve this problem faster. However, finding the balance between speed and quality was most important then and it’s still most important in today’s super competitive tech world and apps economy. I think we see people adapt as technology changes. In our world, manual app testing remains critical even as test automation continues to grow – we see them both excelling at different things. Real people are using these apps so you need to have that human understanding, creativity, contextualization, and variation of how an app is used to feel truly confident that you are releasing a quality product that real people will love. We see engineers and QA professionals adapting and learning to write automation scripts – at the end of the day the human element will always be involved. We’re designing applications to be used by humans. “Automate everything” seems to be the current mindset. However, at what point does it no longer make sense? When we look at the Internet of Things, are we truly solving problems and making people’s lives better, or are we connecting and automating things just because we can? I think we’ll see automation continue to explode in areas where there are real and tangible benefits, such as automotive, energy, medicine, and manufacturing. The connected home will continue to see immense growth as apps and devices answer concerns of quality, reliability, security and interoperability with each other. Sensors are a big piece of automation becoming viable, cheaper and ever more present in the devices people carry. Being able to adapt and be a problem solver. The landscape is ever changing and technology that is new today will be old tomorrow. Can you make this code or device work like a human? Do you accept the current limitations of what we can do today but realize those limitations may be gone tomorrow? A variety of resources and services are available at AIHub, including a weekly lecture series, news stories and research on robotics theories and projects. This website serves as the web’s largest collection of research and findings about artificial intelligence, offering a steady and up-to-date stream of articles. For those who don’t have time to sift through news sources, AI Weekly provides an email subscription-based round up of the top stories every week. In operation since 1979, this professional organization seeks to advance understanding and integration of artificial intelligence. This online magazine is focused on bringing the best and most credible news from the field of automation to one easily accessible location. A nonprofit, Best focuses on encouraging students to pursue STEM-related careers via robotics design. This website is wholly dedicated to providing the latest research and findings on the move towards autonomous and self-driving vehicles. This chapter-based society exists to further innovation, education and research in the fields of robotics and automation. IAIES seeks to advance the use of AI systems to enhance educational offerings at all levels, through workshops, training, conferences, and a variety of member-based resources. This professional organization develops industry standards, provides professional certification for those in the field, furthers research, publishes findings, holds conferences, and offers networking opportunities to its members. This print and online publication brings readers cutting edge research in the world of industrial automation. NASA’s Robotics, Automation and Control division provides the latest research on how these technologies are informing space exploration. This nonprofit focused on R&D advocates for the development and dissemination of open source software related to robotics research, product creation and education. This trade group has been in existence since 1974 and focuses on providing valuable insight and research to engineers, managers and executives within the field. This helpful tool provided by NPR offers a comprehensive search tool on the likelihood of specific jobs being replaced by automation in the coming decades. What keeps you interested in the field of automation and AI? There is no shortage of wicked human problems that science and technology will likely solve. Great forms of automation and AI such as Elon Musk at SpaceX and Tesla, or the remarkable innovations at India’s Aravind Eye Hospital are a huge inspiration for me. Novel forms of software-based automation and AI are unique in that they scale exponentially, with marginal costs. This allows “insanely great” solutions to scale globally that otherwise would be impossible. What would you say to those who are concerned over losing the “human” aspect and having it replaced by automation, whether it be job losses as machines replace workers or the concern of a “robot world”? In the short term, automation and robotics are exciting and practical trends to solve really tough human problems. The use of machines to take over boring, unsafe, and repetitive jobs has been with us for more than a century. There are no horse-and-buggy craftsmen anymore because cars are faster and cheaper than alternatives. The automotive jobs that are left for the people are highly creative. For creative, entrepreneurial geeks, it’s a dream come true. Few innovators want to do menial labor, and would be thrilled to let the machines sweep the floors, or do the dishes. In the short term, automation will take over employee job tasks that are awful, and free the people up to do more rewarding, meaningful and creative work. In the medium term, I do worry about the people in the lowest levels of skill and ability. I lived in India for five years, and many Indians cannot read or write. The moment a consumer-grade robot is produced at price points for the middle class, a huge number of barely employable housekeepers, drivers, and cooks will suddenly be unemployable. In the long-term, I agree with other thought leaders that we really need to be worried about the values systems of conscious AI that might decide we humans aren’t worth keeping around. My next book focuses on this problem with lessons from several different scientific disciplines that I hope forestalls future AI from making us extinct. In the foreseeable future, automation and AI will continue to expand tremendously. I’m especially bullish on hybrid combinations of AI that combine automation or AI with another science, to solve applied or scientific problems in those disciplines. I think they must be an autodidact, because the knowledge and methods in this domain grow fast. They should also have a great deal of passion and perseverance for long-term goals, as “insanely great” technology takes trial and error. If they constantly seek to learn, and experiment while expecting to fail, they can learn from those mistakes and ultimately succeed where others give up.